The kitchen is often command central for the home. For many of us the kitchen is not just used for mealtime; often it is also the heart of the home. Of course, it’s a living space designated for cooking, but it often serves a variety of other needs as well. Because of its multiple uses, mail, messages, and paperwork can pile up on the table. Electronics, medications, tools and art supplies may overwhelm the counter tops, or else we stuff them into drawers to be lost forever. Some of us also need to squeeze in the pet’s food and paraphernalia. The kitchen is a complicated space and requires some initial effort and ongoing maintenance to be organized. 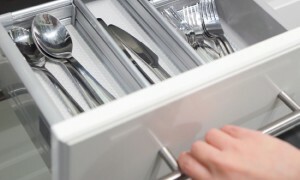 Still, any efforts to simplify and streamline a kitchen can have a tremendous impact on your daily routines. If you haven’t organized your kitchen in a while, or ever, call now to get started. Get yourself or the family ready and out the door easier in the morning. Reclaim your counter space from piles of clutter. Create better storage for the items you use most. Make fewer trips to the store and stop buying duplicate items. Easily access the essential items you need when cooking. Enjoy cooking in your kitchen – make it work for you. Control the flow of paper and everything else that turns up in the kitchen. Whatever your kitchen needs to hold, it should also be a place where you can enjoy preparing and sharing in a meal. It doesn’t have to be perfect, but it does have to store your cooking equipment, so you can find what you need. Many kitchens also need a system for the paper that streams in from the mailbox and the children’s backpacks. Meal planning can feel like an inconvenience, but not having a plan causes stress, leads to poor choices or even worse, takeout – five nights a week. Whether you’re cooking for one or six, having a plan can save you time, money and aggravation at the end of a long day. Check out the blog post Make Your Meal Planning Easy to begin the routine of scheduling your meals and enjoying dinner time again! I am so happy with my kitchen! It makes life so much less stressful to know where everything is. Thanks so much for your help. You have been inspirational; I have been sharing all your tips and advice with my friends and family. I am eager to start working on the next piece of the puzzle – the basement! I hired Heather last Spring as a Mother’s Day gift for my mom. She helped clear and organize her kitchen. She helped find proper places to put certain foods and kitchen supplies. Now that the kitchen is organized, it is so much easier to find and put away items. Heather not only organizes spaces, but she also teaches you how to maintain the space and how to storage your items. She is not judgmental and will help with any areas that you need clearing out or organizing. She is wonderful to work with and is someone I would definitely recommend. We look forward to working with her again!